Ankam is engaged in Design, Manufacturing & Erection of Water Park equipments, Water Slides, Water Play Stations, Themed water play systems, Kids play systems. 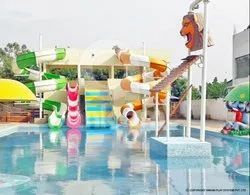 Ankam Is only Water Slide company in India to have Patented water slides.Ankam has unique range of water slides to cater small and large water parks, Resorts etc. Water Park Rides are designed as per ASTM and EN standards to cater water park, Resorts, and amusement industry. These waterslides are custom designed as per customer space and budgets. These waterslides provide a great level of entertainment for kids & adults. We are offering Water Park Equipment to our client. This is an ideal for all Resorts, Clubs, Farm Houses and Water Parks.We Specialized in manufacturing Theme based Water Play Systems. In the field of water slide equipment, our company is recognized as a leading manufacturer, trader, and supplier of Combination Water Slide This slide is available in attractive colors. This Slides can be available at different heights. 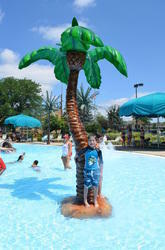 Our company is coveted in the domain of manufacturing and supplying of Water Park Tree. Boarded with nozzles to give water effect. It is thematized to look like Palm Tree. 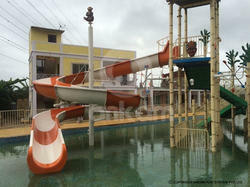 We have risen to prominence in the domain of manufacturing and supplying of Water Park Slides. Primarily, these tube slides are playground items which are available in variegated diameters and are fully customizable. These tube slides are fabricated from a high-quality material and are known to give fantastic experience to the kids. Finally, these tube slides are offered at suitable prices to our beloved clients. Brand Ankam Play System Pvt.Ltd. We are offering Fish Tilting Bucket to our client This Tilting Bucket product is a favorite amongst kids and even adults and gives them moments of joy. It is different shaped, has got multiple showers and has been designed with perfection. It is a product having multiple showers and the steps on one side which is ideal for kid’s pool. We are offering Octopus Tilting Bucket to our client. This Tilting Bucket product is a favorite amongst kids and even adults and gives them moments of joy. It is different shaped, has got multiple showers and has been designed with perfection. It is a product having multiple showers and the steps on one side which is ideal for kid’s pool. 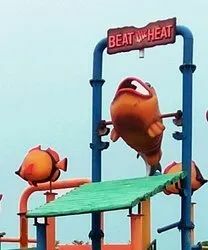 Looking for Water Park Equipments ?